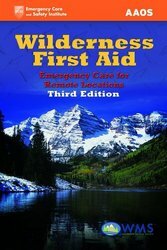 Wilderness First Aid: Emergency Care for Remote Locations, Third Edition provides information on how to handle common injuries and illnesses when medical care is an hour away or more. Designed for those who work or travel in remote locations, this comprehensive guide will teach you what to look for and what to do in the event of an emergency, and direct you to the most appropriate type of care. Completely revised, the Third Edition contains updated information on first aid training and complies with current cardiopulmonary resuscitation (CPR) and emergency cardiovascular care (ECC) guidelines. Current information on injuries and illnesses presented in an easy-to-understand format. Skill sheets providing step-by-step visual reviews of procedures discussed. Flow charts reinforcing the decision-making process and appropriate procedures.